Datinf Measure is a flexible program for length and surface provision in digital images. An adjustable scale allows the program to be used for various different purposes. Datinf® Measure uses vector-based shape measurements similar to those used in drawing programs on an original digital image. 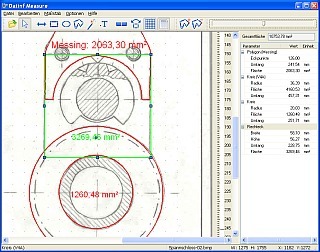 Shape measurements can then be saved and be worked on at a later date. Measurement results can also be exported using the clipboard or as an excel document. The software works with images in various resolutions and formats. Through the use of fast algorithms the software can also be used for the analysis of high-resolution images. In order to carry out a meaningful measurement, the scale of the image must be known. Ideally, the image should have a scale so that the software can be easily calibrated for this size. Datinf® Measure is a product of the DatInf GmbH, Tübingen.